Sixjoy Hong Kong Limited has released a new action game for Android and iOS called War Wings, which it takes you back to World War II, as you play the role of an ace pilot maneuvering historically accurate, fully customizable war planes. You can fly as a lone wolf, play solo, or you can team up with allies and join squadrons, earning bigger rewards and taking advantage of the game’s social features. And that’s where the true fun is, as you can compete against millions of real players from around the world, teaming up with your squadron mates and destroying rival squadrons as you climb up the PvP leaderboards. Yes, it’s all well and good when you’re dominating AI enemies, but that’s the main come-on of the game – a chance to get into virtual dogfights with real players. There are also more than 70 war planes to choose from, all of them customizable, and all of them capable of dealing out and taking realistic damage. And at the end of the day, you’ll be tested each time you play, coming up with tactical strategies as you seek to take out more enemies, whether playing solo or playing as part of a squadron, whether in PvP or PvE mode. But we’re going to be keeping things simple here, as we give you some War Wings tips and tricks that can help you rule the skies and take out the opposition. When you’re trying to track down enemy planes, you have three methods available at your disposal. Simply tap on an enemy to track them, or choose God View, which allows you to get a fuller view of the battle, and a better look at where the enemies are located. Once in God View, you can select the enemy of your choice and lock on to them so you can take them out easier. Jager is the second tracking mode, and this allows you to automatically track down enemies. If you don’t see anything after tapping on Jager, that means you haven’t selected a specific target just yet. Lastly, Padlock allows you to focus on a specific enemy. That also lets you see where you are in relation to an opposing plane. Swiping on the screen allows you to do special maneuvers – as there are more than one which you can do, it would depend on the direction you swipe toward. These include Evasive Maneuvers, which do just as the name suggests – the enemy won’t be able to track you for a few seconds after you do an Evasive Maneuver. Use these to shake off those enemies that may be tailing you from behind. Counter Maneuvers, on the other hand, are only available in PvE mode. Now this is where our oft-repeated maxim of “best offense is a good defense” comes into play; while you’re on the defensive, you could turn the tables and go on offense by having a good position on the enemy plane. You’ll need to be prepared for those situations where your plane may stall while in midair. Normally, this would happen if your plane doesn’t have enough power while it’s ascending. How can you deal with such a situation? Fortunately, it’s relatively easy. Just hold on the acceleration button while you’re gaining altitude. But make sure not to hold on to the button for too long, as accelerating too much may overheat your engine. To avoid this, you can let your engine cool down a bit before you accelerate and gain speed. Also, hit the acceleration button if your plane is preparing to return to its normal speed. Let’s move on to the act of dropping a bomb, which is yet another important aspect of playing War Wings. You should be at a certain distance above enemy ground units before you drop the bomb, and if you’re not high enough, you can pull up and gain the required amount of altitude. Once you’ve reached the right altitude, start diving down and look for the point where your target is within the indicator. Wait for the indicator turns white, then drop the bomb. That will allow you to inflict the most amount of damage. Last, but certainly not the least, we should advise you to join a squadron, which is War Wings’ equivalent of joining a guild or a clan in RPGs. Being part of a squadron allows you to take part in all that 4-on-4 player-vs-player goodness, and you stand to receive some cool rewards if you perform well in PvP and climb up the leaderboards. 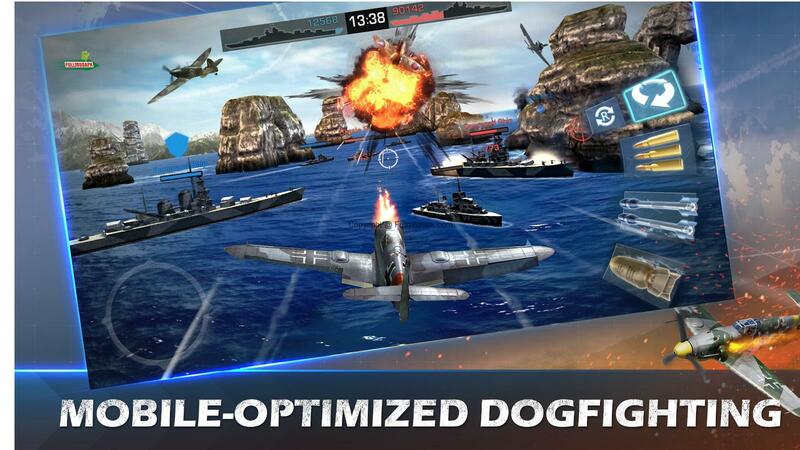 This wraps up our list of tips, tricks and cheats for War Wings. In case you know additional tips, feel free to drop us a line!